The budgeting is real! This dumb piece of a deck centers on two cards, Shadow Reflection and Furor Chakram. With the right setup, these two cards can create an amazing amount of burst as well as board clear (best served together, in the ideal scenario). To benefit from these cards, we bring in the good’ol Tiger for a 7 mana 8-10 damage finish, Grimes who is as stupid as ever in various fun and interactive™ combos, Elkowl for creative keyword shenanigans and Demonic Conversion/Bound Tormentor for stealing Makantors, Wind Dervishes etc. which combo well with Chakram. WR was 14-6 (70 %) in Gold. Seems to be on the outdated-section btw, could it be moved to v1.96? You know best when this thread starts not to be outdated anymore. Could you give me an exact link please? In this edition of budget decks, we make one annoying cheap threat after another and wait for our opponent to drown in a sea of stuffz and dispel. Metallurgist into Hailstone, Vale Hunter into Shiro + Lure, Oculus and Tahr give plenty of tempo-positive t1-2 plays that demand some kind of answer. Most of the time it’s correct to bodyblock with Lili and wait for removal, then drop in Primus Shieldmaster, Hailstone and Capricious Marauder (if the board gets cleared). Chakram and Shadow Reflection are used nearer to the endgame (which nowadays starts around 5 mana) to close the game out. Lightbender and EMP help out a lot against many decks in lower ranks as well as above, and synergize well with Marauder. Even though the deck seems really simple and even somewhat lacking in terms of wincons, it’s a really consistent build that has potential to teach you a lot about positioning. Using Oculus correctly is especially probably the most challenging part of the deck, since played with correct timing, positioning and cashing out it can really trash some otherwise difficult matchups. One more upside to this deck is that nobody really realizes what it exactly is you’re trying to do, until you’ve already brought the opponent down on hp and minions. WR was 16-4 (80 %) in Silver and Gold. Right now I am busy with moving all or most of the decks from the wiki to Duelspot Yesterday I added over 40 budget decks. 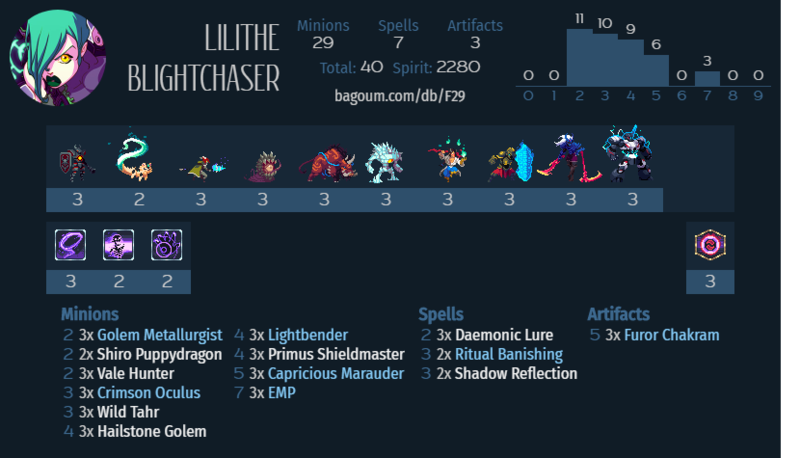 That took some time but it is worth to have a centralized decklist tool. Sure, I’ll consider it might take some time though!